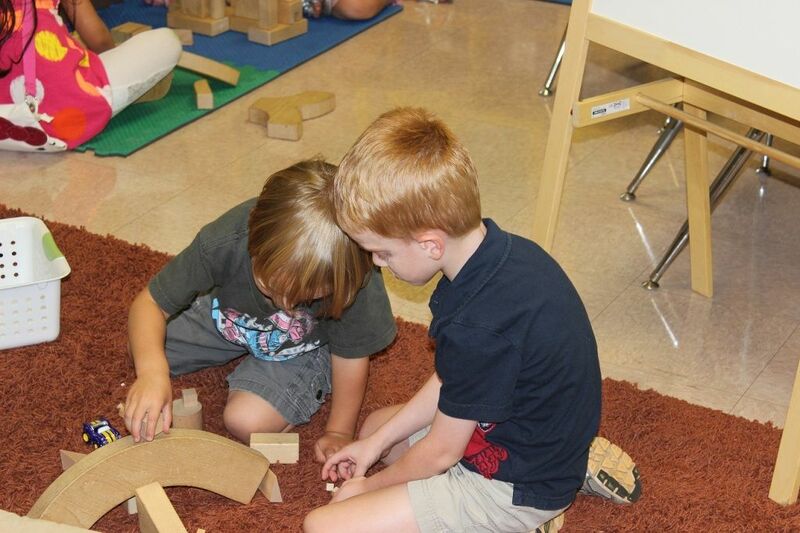 Evan and a new "friend" in his class already bond over blocks. 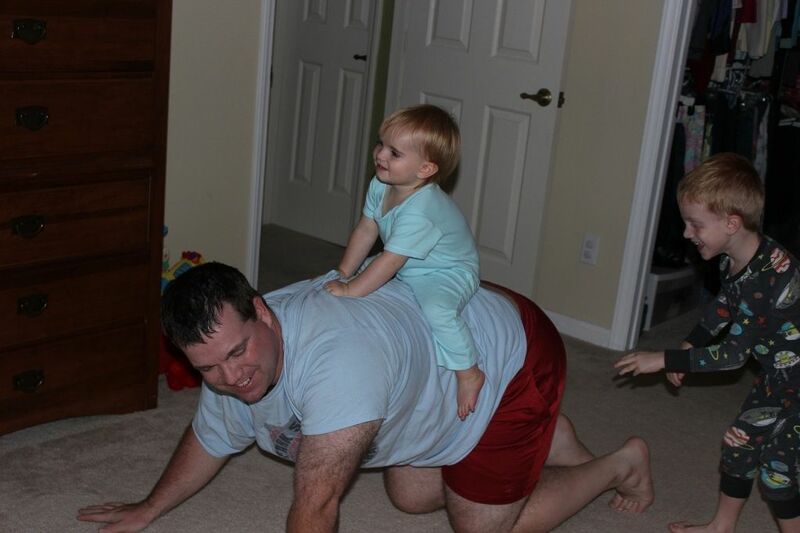 Just like last year, I am sure blocks will be one of his favorite activities! 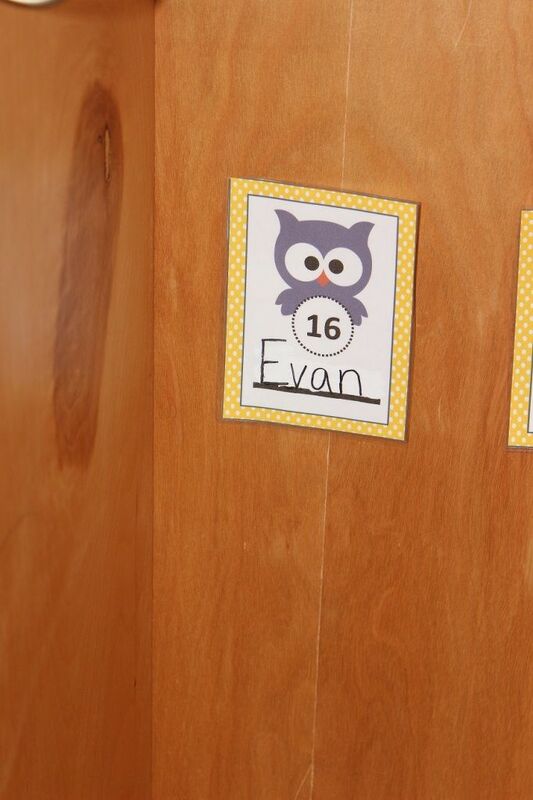 Evan is a Bright Owl! 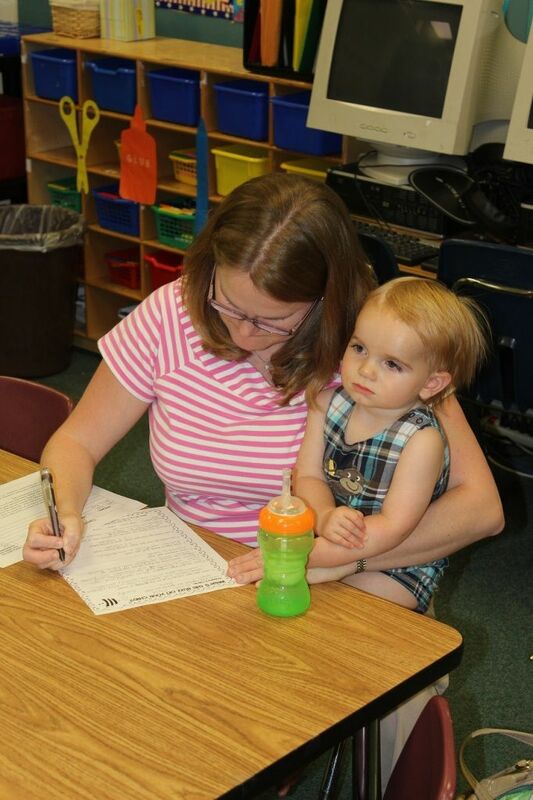 Mommy fills out an information sheet about Evan for his teacher. I just love this shot because it shows how OCD my son is. 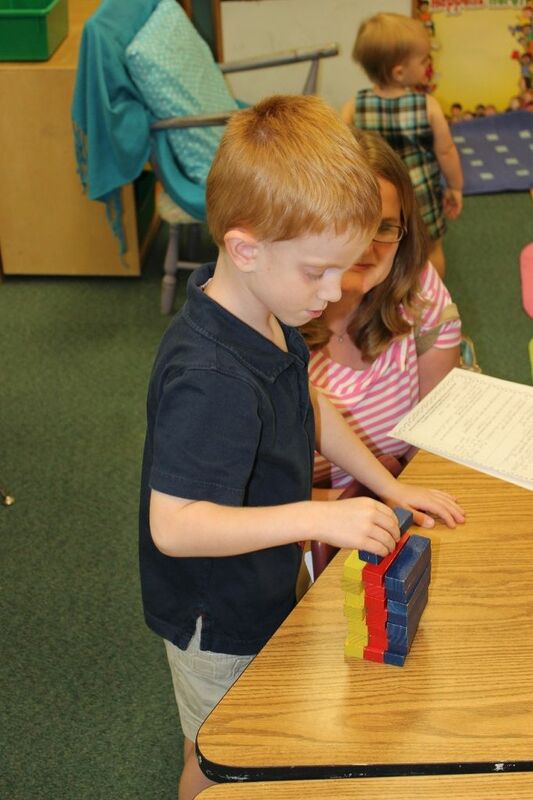 Yes, he is truly my son as he has to create a "perfect" color pattern of blocks! Brody really liked Evan's classroom too. 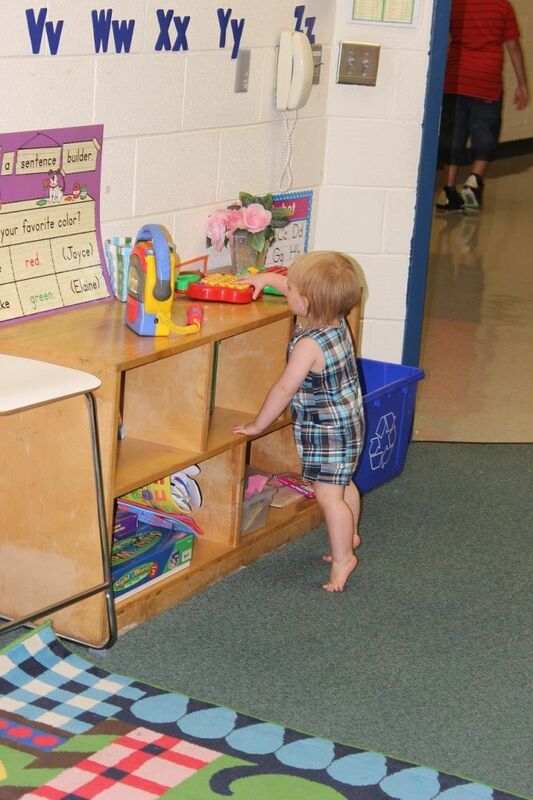 Look at those tippy toes! 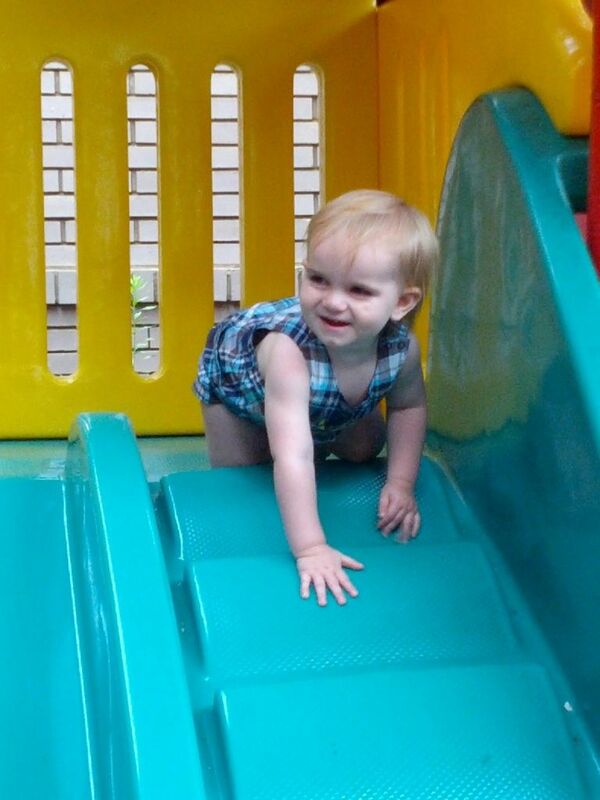 Playing on the little slide. 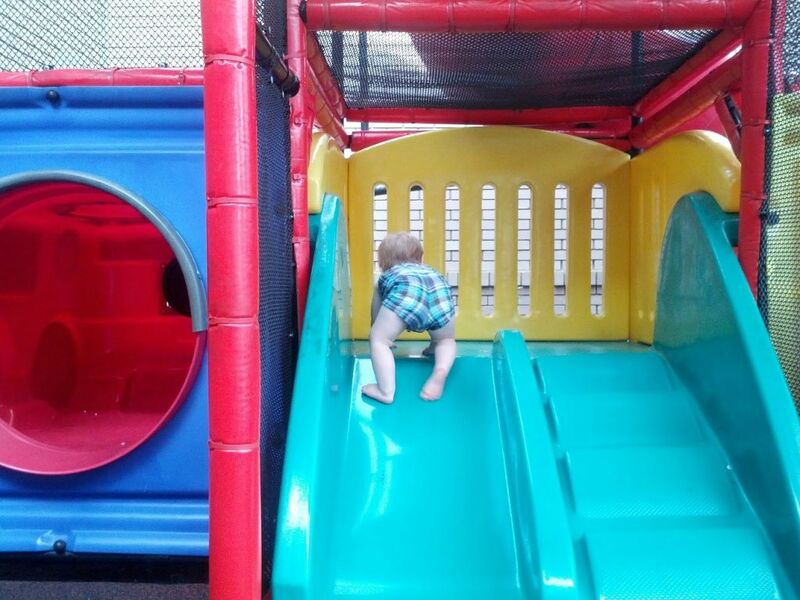 This is one of the few play places I've seen with a legitimate toddler sized slide. 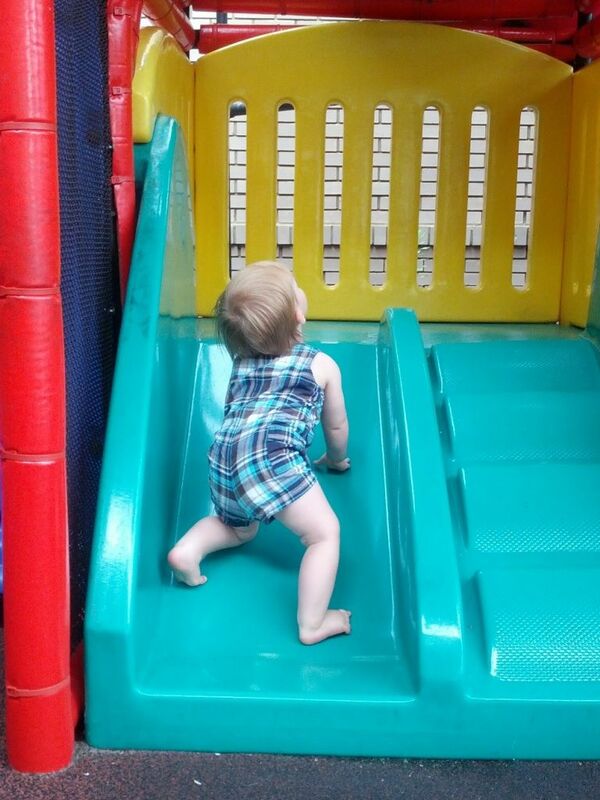 Evan actually used to love it too and took his first steps here! 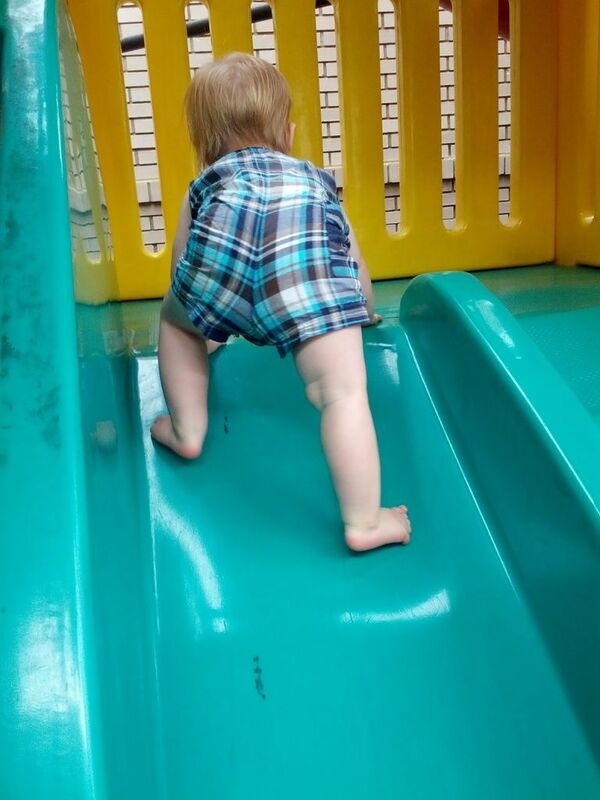 He figured out how to go down the slide by himself...on his belly! Silly boy, you can't go down that way. 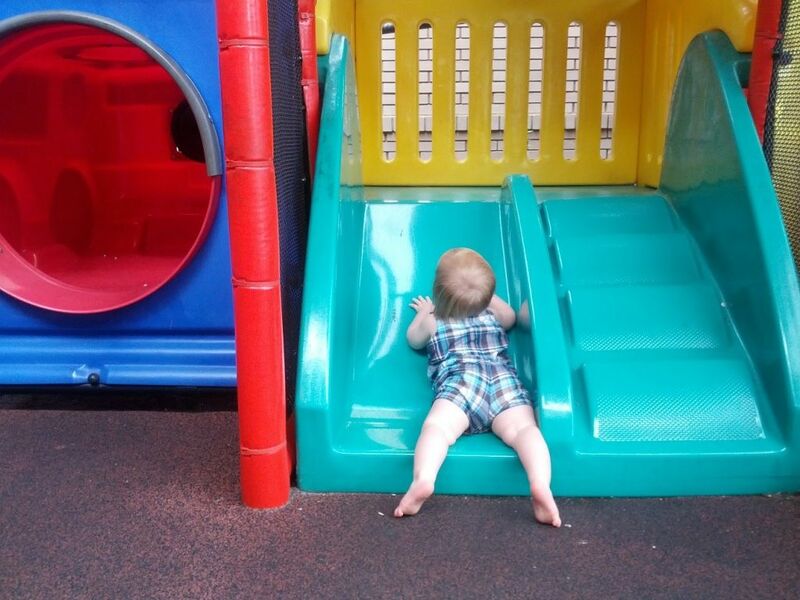 He would climb up the slide and go down the stairs...backwards kid! 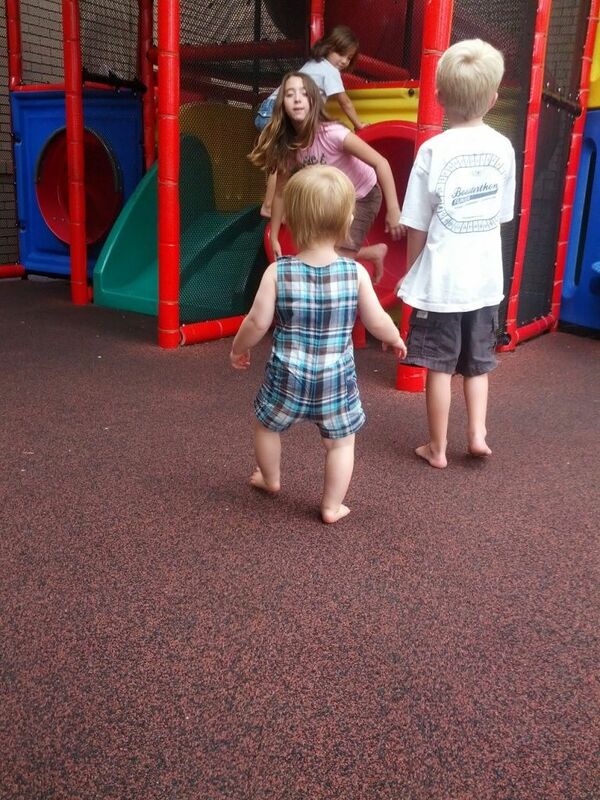 He loved watching all these big kids. 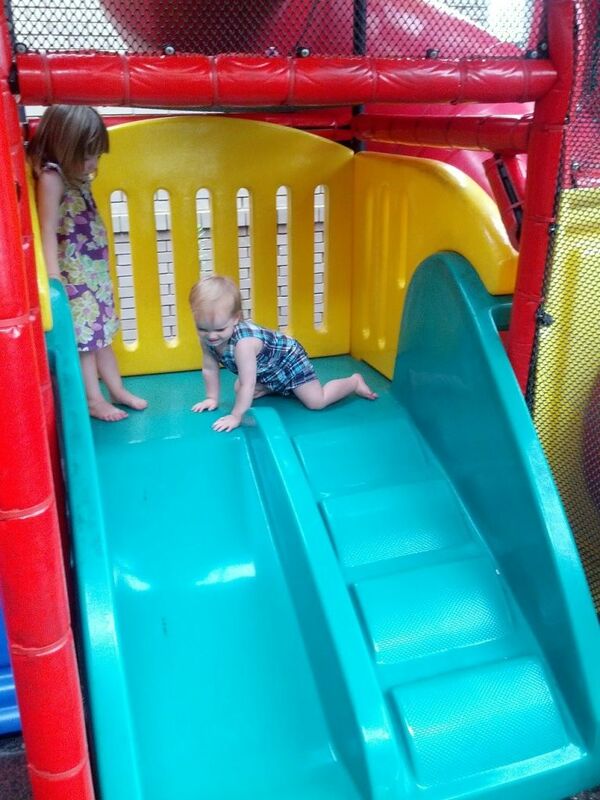 He loved following this little girl around, but he hasn't quite learned the "wait your turn" thing and would just cut in front to go down the slide. She was very gracious. 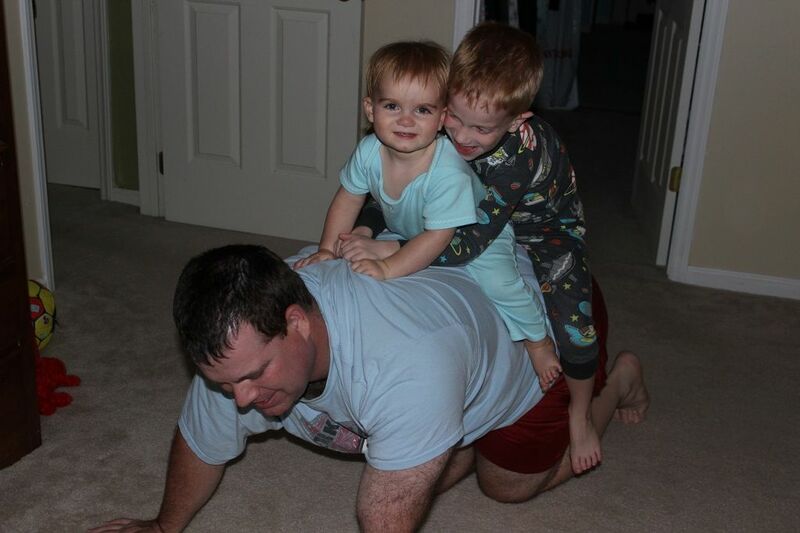 And after we got home and had baths, both boys had to have a horsey ride! 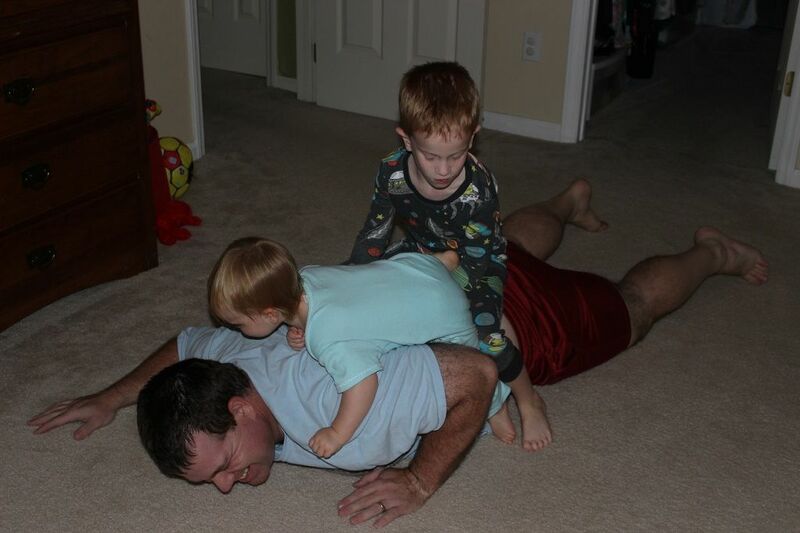 And they brought Daddy down! Evan is going to have so much fun! I don't think you have to worry about him making friends...he seems very much the social butterfly! I have the same fears with Spencer about other kids being mean. He is actually pretty outgoing but because of that I worry that he will be friendly to someone and they will shut him down. 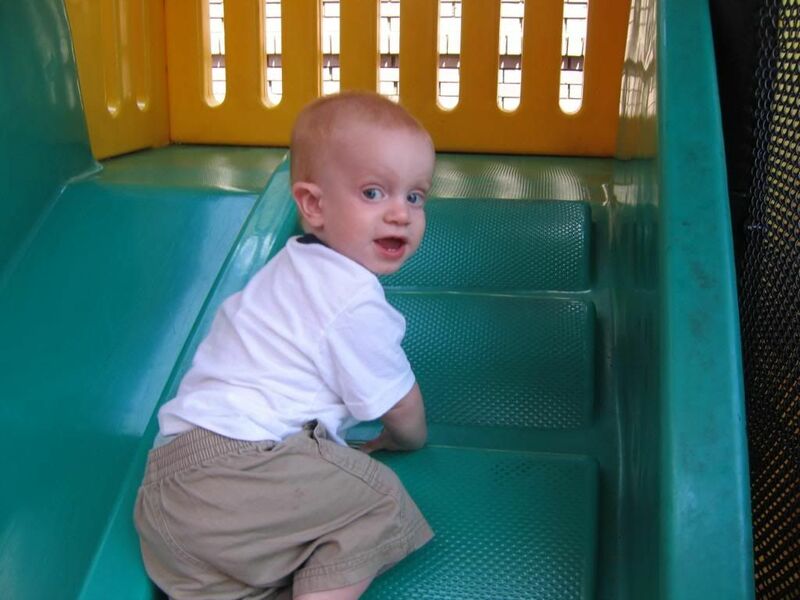 How cute is Brody playing on the playground? And I just love the outfit! I think you mentioned once that it was an Evan hand me down. I actually bought it new for Elliott at the beginning of July. How crazy it that?! 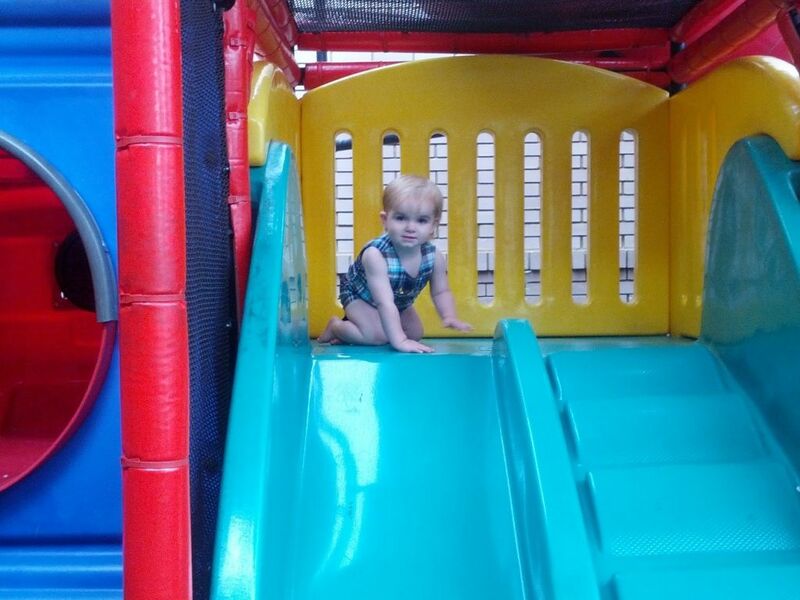 Brody had a blast playing in that play area, but the truly disgusting part came when I wiped his hands and feet down with a Purell wipe before we left (luckily the restaurant has those handy). Wow, his little feet were black! :-( I figured just the thought that I let my kids play there would freak you out! Haha! 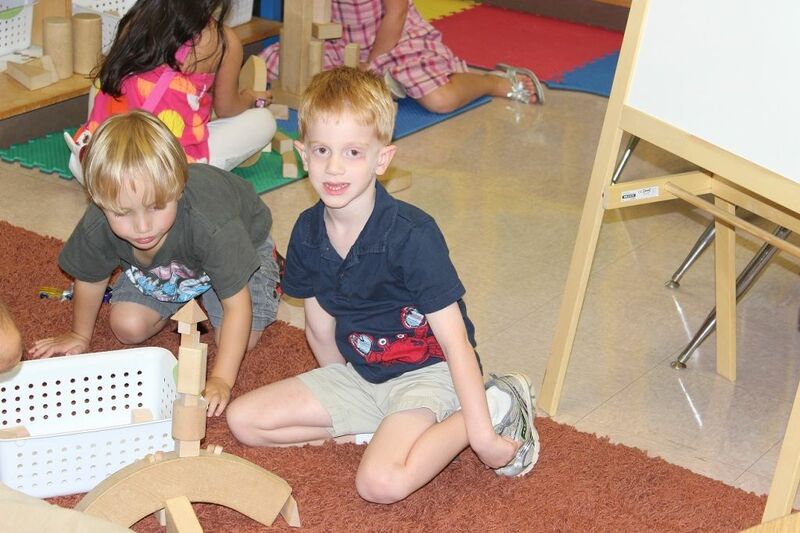 Oh, I know you are anxious about Kindergarten... I am about 2nd grade & 10th!!! YIKES! Where does the time go!! Oh, and the germ pit..I am with you there! I cringe when Kea asks and usually the answer us NO...I know mean Mom. Bless him he get a good coating with anti-bac when he is done! Finally catching up on blog reading :) Sam is starting preschool two afternoons a week next week and I am so nervous about it. I know it will be good for him (and for me!) 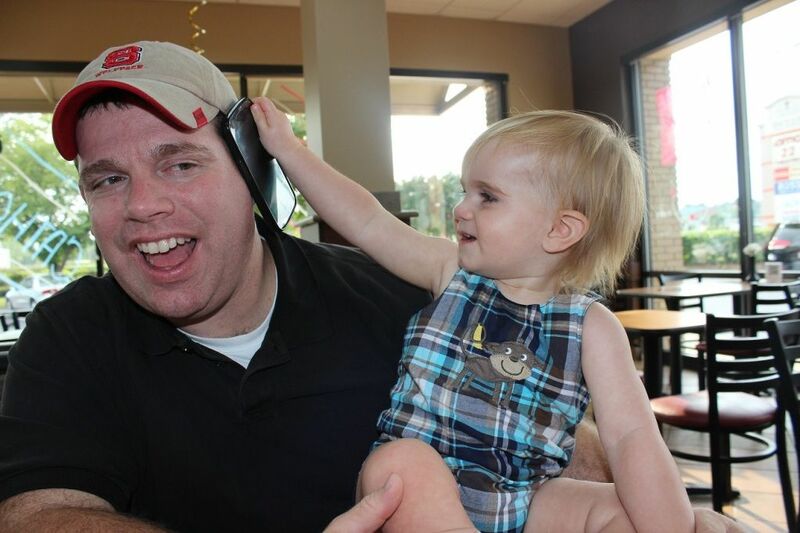 but I have some of the same feelings you mentioned with Brody starting kindergarden. I pray it goes so well for both our boys.